My iMac is in the den and my stereo sound system is in the living room. I wanted to listen to my iTunes music library on the stereo, so I installed a Roku SoundBridge M1000 with little effort and immediate gratification. The SoundBridge from Roku LLC (http://www.rokulabs.com/) is a network music player that that integrates seamlessly with iTunes. The design of the device is so elegant that it could easily be mistaken for a product from Apple Computer, Inc. The Roku SoundBridge does not store your music. It retrieves music from iTunes and shows playlist information on its display. Using the remote control that comes with the SoundBridge, you can select your music by playlist, album, artist, composer, genre, song, or use the shuffle button to play selections in random order. A Roku SoundBridge connects to a computer with Ethernet or wirelessly via 802.11b. I'm using a wireless router and the CompactFlash Wi-Fi card that came with the SoundBridge. 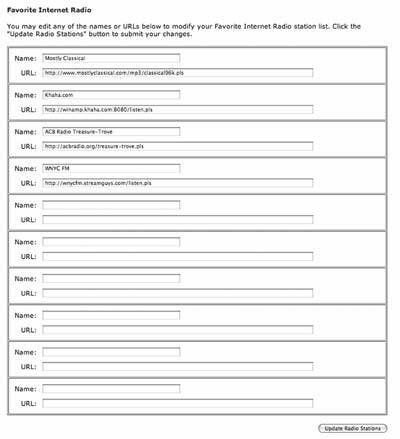 Check the Roku list of supported hardware to see which routers are recommended since some perform poorly or are incompatible (http://www.rokulabs.com/support/sbaccesspoints.php). The SoundBridge easily connects to a stereo receiver or powered speakers and it uses a small power cube rather than the traditional power brick. Your Macintosh must be turned on with iTunes running to listen to your music through the Roku SoundBridge or to access Internet radio stations from an iTunes playlist. 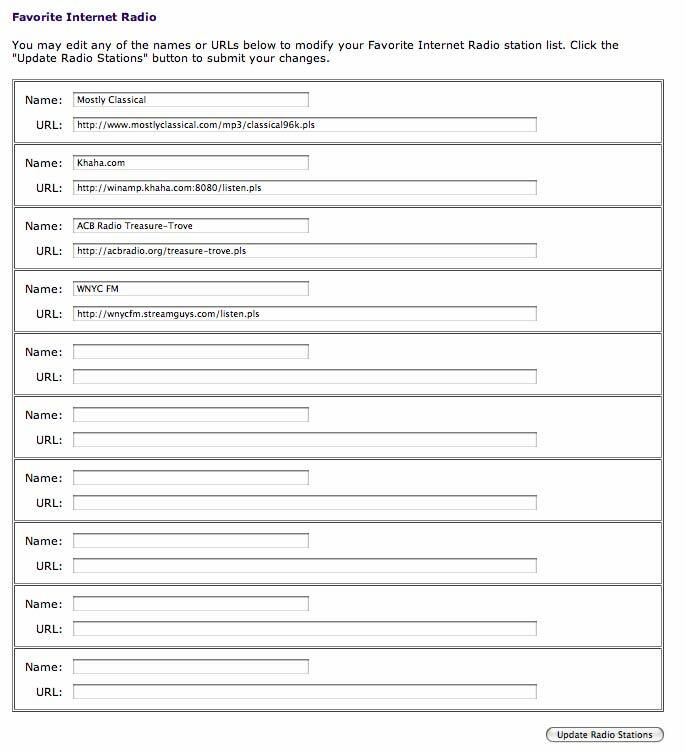 You can listen to the Internet radio stations that are stored in the internal directory even if your Macintosh is off. 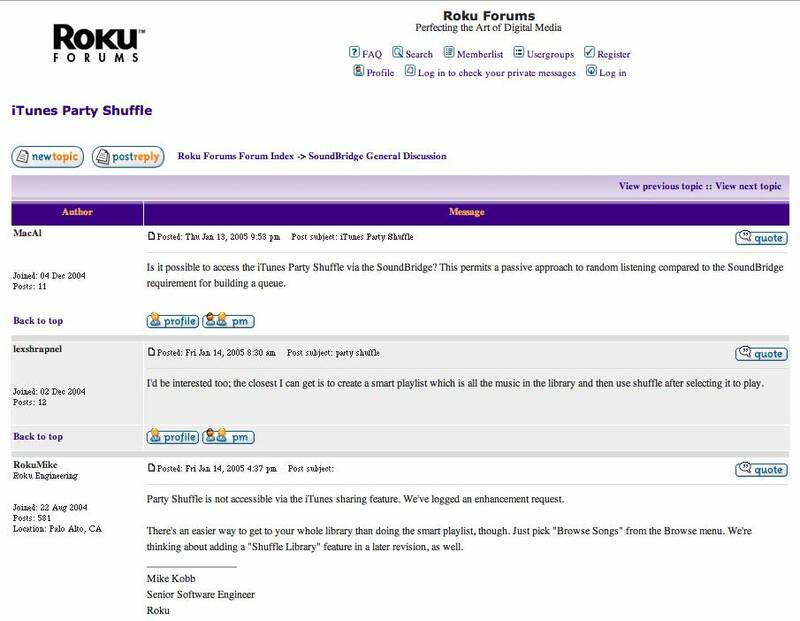 Roku is a small California company that actively participates in the on-line forum it sponsors (http://www.rokulabs.com/forums/). They welcome suggestions for enhancements. New versions of the firmware, including beta test versions, are easy to download directly into the SoundBridge (http://soundbridgeupgrade.rokulabs.com/cgi-bin/beta-signup). There are two limitations to consider. First, Apple Computer has not licensed Roku to play music purchased from the online iTunes music store. If Apple issues the license, Roku will enable playing this music on the SoundBridge. The second limitation is the wireless protocol. A Roku SoundBridge ships with an 802.11b Wi-Fi card. Currently, there is no support for the higher speed 802.11g protocol or encryption. However, the 802.11b speed is sufficient for music streaming. Reports on the Roku forum state that a network that shares both 802.11b and 802.11g devices will slow to the 802.11b speed. Roku engineers say that they are reviewing 802.11g Wi-Fi cards for compatibility. Since I have never purchased music from Apple and the only wireless device I use is my Roku SoundBridge, these issues did not affect my purchase decision. How do the Roku SoundBridge and Apple Airport Express differ? The SoundBridge has an excellent display and music selection is made from the SoundBridge. Airport Express has no display and the music selection must be made from your Macintosh. The Airport Express will allow iTunes Music Store purchases to be played. Roku offers three models of the SoundBridge. The company states, “The only difference between the M2000, M1000 and M500 models is the size and capabilities of the display.” They are priced at $499.99, $249.99, and $199.99. For details, go to http://www.rokulabs.com/products/soundbridge/models.php. In December 2004, Best Buy sold the M1000 at $199.99. If you purchase a SoundBridge directly from Roku, they offer a 30-day no-questions-asked money back guarantee. The user manual is available at http://www.rokulabs.com/support/sbuserguide.php. What are you waiting for? Now you can listen to all the music in your iTunes library from any room in your house.